I’m very curious to see how successful your project is! 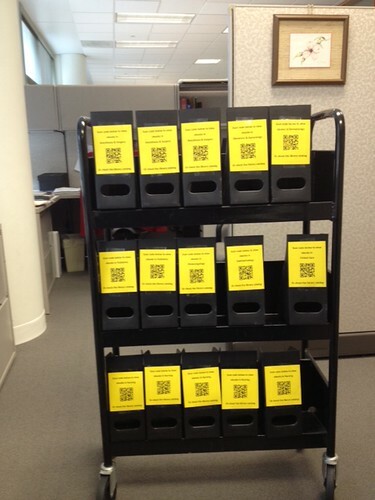 We tried doing a QR Code project to promote interaction with staff & patrons, trying a “scavenger hunt” theme to it for a chance to win an iPad. I wouldn’t say it was too successful, but it was a start. Good luck! Perhaps a Smartphone QR Code ‘Drop In and Learn’ Workshop might be planned. I think people have to see how the technology can be used in everyday situations (perhaps fold in a bit on barcode apps and uses for price comparisons). 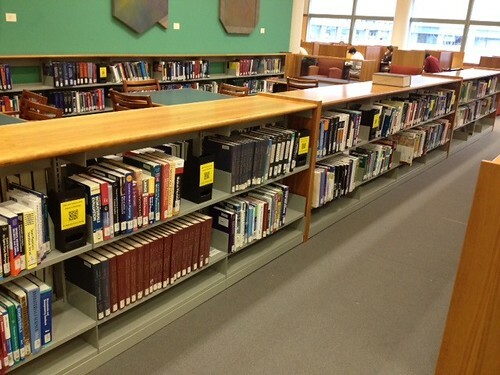 You also have to make sure your own library content works and is updated frequently. The history of QR is interesting too, I wrote about it (see my linked website) on this comment. incentives. is there some way to add the chance to get a free gift card to starbucks or amazon by scanning the qr code? Interested to see how your qr promotion works, would like to do something similar here. Do the QR codes link to subject-specific searches in your ebook catalog? I just tried to replicate this process with our Overdrive-based catalog, but I couldn’t attach a QR code to a pre-determined search. The link essentially just took me to the Overdrive website, forcing me to create my own search. I’m essentially asking if all of your QR codes are different, or if you just copied the general link’s QR code to the different yellow sheets. Yes every QR code is unique to that subject. 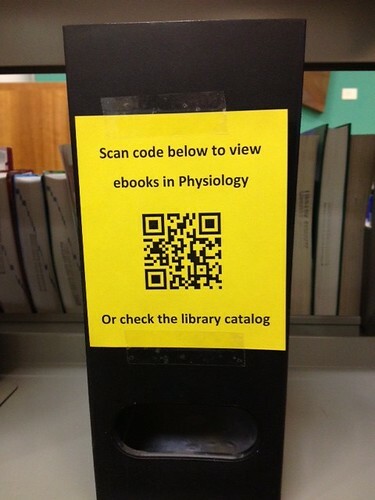 So if somebody scans the one that says, “Scan code below to view ebooks in Physiology” they will get a list of books w/n in our catalog that are only on Physiology and only ebooks. 1. If we own the book in print and ebook, the print is also displayed. In fact it is one record. This is a bit of a controversy w/n the cataloging world…but our print holiding have the ebook links w/n the record. There is not a separate bib record for the print and a separate for the ebook. So he list contains some books that we have in print too BUT they all are ebooks. 2. I created the subject searching using the call number. Catalogers catalog to the specific topic not general topic so I couldn’t do a MeSH search for Cardiology and get all the books because our catalogs aren’t quite set up like PubMed. So the easiest way to get a general subject like Cardiology was to search for all books with WG as the call number. Then the search was limited to ebook. Now I had problems keeping that search URL persistant. We use Innovative Interfaces and while it kept the call number search it would lose the limits. Thankfully our person who works with Millenium was able to figure out how to make it all persistent. Here is one of the full URLs to the call number ebook search for Pathology. I copied and pasted all of the call number searches and used delivr.com to create the codes. Delivr will create the code and give me usage stats. The project has been live for about 4 days so not a lot of usage yet and today they just changed our server settings so right now their are some access problems that we have to fix. So a little bit of stumble out of the gate. Thanks so much for the clear description and photos. I’ll be sharing a link to your post as part of our JISC-funded M-libraries Community Support Project (see http://m-libraries.info) as I’m sure this will be useful to a lot of other libraries. Are your ebooks all supplied by the same provider? Are they accessible from any mobile device? In the UK many of our ebooks will not work on mobiles or authentication won’t work due to too many redirects. I scanned your example (sorry for skewing stats!) and noticed the catalog is the desktop interface, do you have any plans to implement a mobile catalog interface? I wonder if you have any screenshots you could share of the stages the user will go through after scanning the QR code (e.g. catalog search, item record, authenticating as one of your users, and viewing the ebook)? Hi Jo, I will work at getting you some screen shots of what the patrons see. Our ebooks are through multiple providers. Some of these providers make their books mobile friendly some do not. The ones that do not people on phones will have to do some pinching or expanding. People on tablets should be fine. All of the books are available through the web so they are available on any device. Authentication is a problem. Currently off campus access is not possible using the QR codes. It is too cumbersome for for us to figure out proxy authentication and be able to make everything seemless. On campus access is mostly seemless. We have run into problems ebooks with McGraw Hill’s Access databases and MDConsult, currently their server notices the mobile devices and directs them to the mobile website which is great if it weren’t for the fact that the mobile site demands a personal login to access (even on campus). You can access the full site by tapping on the full site link. So to sum it up our ebooks and vendors (like most of the medical world) are in varying states of mobile accessibility. That is a barrier to access, but waiting for all the vendors to get their acts in gear to have logical mobile access isn’t a great option either. Our catalog is not mobile friendly. We use Innovative Interfaces and I THINK (not sure) that getting a mobile interface on Innovative costs extra (as almost everything with Innovative.) So we are in a bit of a chicken and egg situation. We would like to have usage stats to know how many people use our stuff on mobile devices BUT in order for us to get our catalog mobile ready we have to buy the product. We don’t want to buy the product if our mobile usage numbers can’t justify it. I do think we will eventually need a mobile catalog, but when you are in a hospital where mobile devices are tightly regulated kind of makes it timing of purchases difficult. Our library is embarking on something similar. Authentication is my biggest issue. “You can see it but nah, nah, nah, nah, please follow these arcane steps to get the fulltext!” *Sigh* Please let us know how it’s going. We need a little more information to try and trouble shoot. Were you on 3G or wireless when you scanned the code? If you were on 3G you went to the site but the site blocked you because you aren’t on the institution’s IP range. If you use 3G to access resources then you must login as if you are off campus (if you have off campus access set up). 3G uses the cellular network to access websites and will treat you as off campus no matter where you are. If you were using wireless then most likely your wireless IP range is not on file of approved IP ranges for that resource. When you submit the list of IP ranges for your institution you will want to remember your wifi range. Any comments, these months later, on how it went? What did the QR code tracking tell you? I have thought of doing such a thing, but I’m wondering whether it’s worth the effort. I stumbled upon this article and noticed it was from 2012. How is the QR code going for you? Has it been a success? I am a very small Library and would like to try this but not sure if it would be worth it. Thank you! It was a limited success for us. 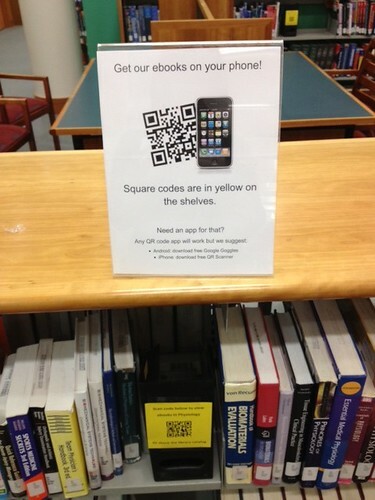 I think it brought greater awareness to our online books, but due to hospital security firewalls and a few other things the QR codes just never quite caught on like I thought they would. Melissa Ratajeski and I just submitted our article on the use of QR codes (her library did something very similar so we decided to co-author a paper on our experiences). That paper goes into more details about how we set it up and the roadblocks we encountered.